There is nothing better than when the weather starts warming up, you can see the early signs of summer, and you walk into the commissary and see that it’s cherry season. Cherries are sweet, yet tart, and are easily portable snacks. I love to take them traveling with me, especially on car rides. I had never really cooked with cherries until this food challenge, but will now that I have tried it. I will admit that pitting the cherries is an arduous task, but worth it in the end. Even so, cherry season remains my favorite (maybe even better than Christmas). If only it lasted longer! Chow down on cherries as long as you can. This was delicious! I would absolutely serve this dish again, especially for dinner guests, since it’s easy and impressive, both tasting great and looking magnificent. I think the cherry salsa would also be fantastic on grilled steak or pork. I was inspired by my love for KIND Bars to try and throw together my own granola bars (with a little extra protein). First I dried the cherries in the oven. Once that’s done (and it does take a little while) put them in the following recipe. Although you could always sub in store bought dried cherries, I warn you to check the ingredients. Most dried fruits have a lot of added sugar or other chemicals so I highly suggest drying your own. Preheat oven to 350 degrees and prepare a 8x8 pan with cooking spray. Set aside. 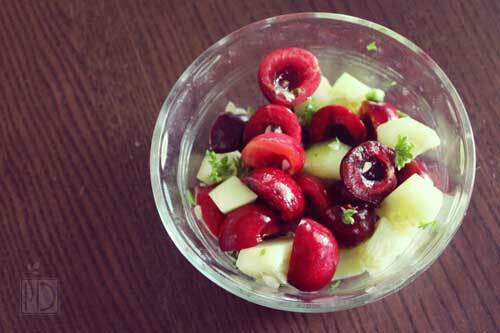 In large bowl, combine dry ingredients minus cherries and chocolate chips. Set aside. In a separate medium bowl, combine wet ingredients. Mix until fully combined, then add to dry ingredients and mix thoroughly. Fold in chocolate chips and cherries. Pour into baking pan and press into pan with spatula or hand. Bake for 18-20 minutes, or until slightly brown on edges. Remove from oven and let cool for at least 20 minutes before cutting. Take this to your next summer BBQ and I guarantee that it will be a big hit. This salad is so summery but not the normal coleslaw or potato salad. The spicy and sweet mixture had me swooning. Not to mention it is incredibly easy to throw together!